King Dasaratha decides to perform an Ashwamedha Yagna to have a son in the Ramayana. 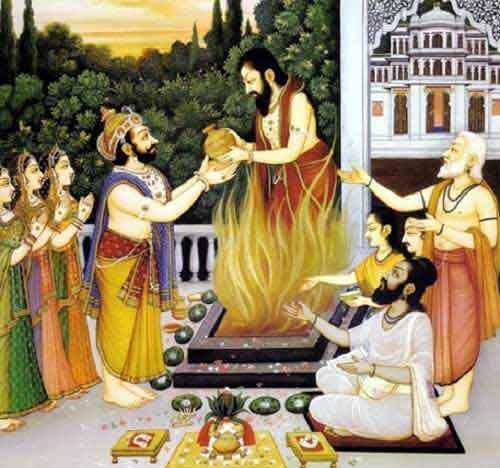 The decision is welcomed by the sages and they all proceeded to make the necessary arrangements of the yagna. Sumantra, the charioteer, then reminds King Dasaratha of something he has heard from elders and narrates the story of Rishyasringa. Sage Sanat Kumara while discussing about future events had predicted about the birth of a great son to King Dasaratha. Sage Kashyapa had a son named Vibhandaka. Sanat Kumara predicted that Vibhandaka will be the father of Rishyashringa. The birth and life of Rishyashringa will be mysterious. Rishyashringa will live in the forest cut off from other human beings. His only contact will be his father. When he reaches teenage, Anga, a nearby kingdom, will be ruled by Romapada. Kingdom of Anga is in terrible famine due to a curse and only way to get rid of the curse is to bring Rishyashringa and get him married to Romapada’s daughter Shanta. But no one will be willing to take the journey to forest to bring Rishyashringa fearing the wrath of Vibhandaka. Finally, courtesans will be venture into forest and lure Rishyashringa into Anga. He will then marry Shanta and rule Anga. Later, Rishyashringa will preside over a famous yajna which will beget King Dasaratha sons. Sumantra then requests King Dasaratha to discuss the matter with Sage Vasistha and others. The sages were too happy to have Rishyashringa preside over the Ashvamedha Yaga. When the Ashvamedha yagna was drawing to a close, King Dasaratha requests Rishyashringa to perform Putrakama yajna to beget a son. When the yajna was drawing to a close, a divine form appeared on the yajna fire and handed over a golden bowl with ‘payasa’ (sweet) to King Dasaratha. The king distributed the sweet to his three queens and a year later they gave birth to four sons – Lord Ram, Lakshmana, Bharata and Shatrughna. Thus sage Rishyashringa played a major role in the birth of Lord Ram.